During my first 13-years living and working in SE Asia, I helped develop eight community programs throughout the region. These came about while leading trips with my former travel company and addressing perceived needs as they were encountered. From leading English workshops for students along the Thai-Myanmar border, to building a school in Nepal, and creating a program that transported sick children to hospital in Cambodia, this work was extremely rewarding and fun. I’d never planned to get involved in such endeavors, but quickly found them to be one of my favorite aspects of living and working in my adopted home. Perhaps that’s the best part of a rewarding experience in one’s life – when it isn’t planned – comes about organically, draws you in, provides learning opportunities, joy and a chance to leave an area better than you found it. A flattering byproduct came in 2004 when I was awarded Alberta’s Provincial Award Celebrating Excellence, which recognized using my Canadian post-secondary education to better the global community. Time went on, our community programs continued, then I sold out of my travel business in March 2013 and haven’t done any community work since. Perhaps my mind wasn’t in the proper space to get involved in community programs, but in late 2015 a spark went off after reconnecting with an old friend I’d backpacked with in Australia more than 20 years ago. Via Facebook I reconnected with Dorthe Pedersen, a Dane who co-leads an innovative project, Cycling Without Age (CWA). 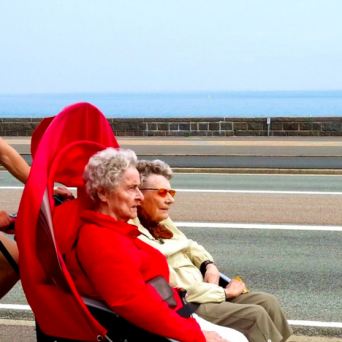 Using high-quality trishaws, CWA volunteers take elderly passengers on bike rides, helping them to once again enjoy the great outdoors, but also connecting generations and providing a medium for storytelling and sharing. Drivers of the trishaw are generally younger than passengers and a key aspect of the rides is talking along the way, sharing stories and helping generations bond. There are CWA chapters in more than 20 countries and I was immediately struck by this incredibly simple but amazing concept and began looking in to it. 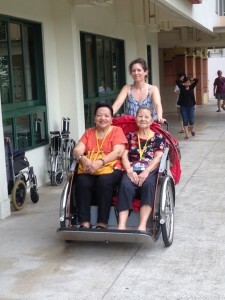 A family trip to Singapore in February 2016 gave me the chance to meet Ms. Pernille who operates CWA’s Singapore chapter, learn about her experience and see the trishaw in action. 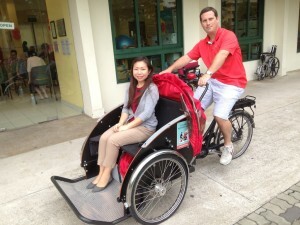 She got a trishaw in early 2015 and has been building a network of riders and passengers since. I met her at St. Luke’s Eldercare Center in Serangoon where she was meeting with staff to hear how the bike has been used and received over the last month. During my visit she pedalled a few people around, their faces lit up and I was completely sold. Seeing CWA in person convinced me how innovative this endeavour is and beneficial on many levels. I took the trishaw for a short spin and was very impressed with its sturdy construction (Danish-made) and how well it rides. I’m currently reaching out to contacts and hope to report back later in 2016 with the announcement of a Bangkok, Thailand chapter. If you’re interested in getting involved please send me an email. We’re getting older at the same rate and CWA provides an ideal medium for all of us to bond, share stories and enjoy the benefits of being outdoors together. Keep up the great work Dorthe and team and thank you for inspiring me.